I probably haven’t mentioned it much at all on this blog but spelling errors are a pet peeve of mine – particularly when it comes to food. Restaurant signs and menus are often the main culprits when it comes to poor spelling. My husband and I will often judge a restaurant by the number of spelling errors we find in their menu, especially if they are trying to be swish and upscale. While I’m not perfect and probably have a few typos on this blog, I think that if you are going to print a sign for your business, it really should be proofread by multiple people – after all, the misspelled sign is a reflection upon the owner of the establishment. I don’t know what Belguin chocolates are but I’ve heard of Belgian chocolates…in fact I went to Brussels purely to do a chocolate tour. Thousands of people including myself have been following veteran American journalist Leroy Siever’s daily blog “My Cancer” on NPR (National Public Radio) in the U.S. and around the world. His daily journals on his struggles and thoughts about his cancer formed a community – a community of so many people around the world who have been affected by cancer. He brought solace and support to more people than he probably imagined it would. Just reading comments left by readers is amazing how much of an impact he had by writing this blog. Leroy passed away last night and I write this with a heavy heart. Although he was told he was only going to live for 6 months, he lived for 2 1/2 years. So many people got used to reading his daily emails and like me, probably wished for a miracle that his cancer would stop growing. I contemplated for a few seconds on whether I should write about this on a FOOD BLOG. But then, I thought about it and realized that this is MY blog and although food is my passion, fighting cancer is equally important to me also. During this past year, THREE very close people to me have been fighting advanced stage cancers and it is a disease that does not discriminate and it is very sad. 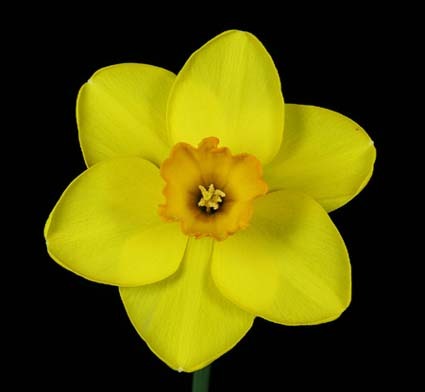 This Friday, 22 August 2008 is Daffodil Day in Australia and 29 August in New Zealand. Please buy a bunch of daffodils for $5 and/or donate to your local Cancer Council or Cancer Society. There will be many volunteers (including myself) this week selling Daffodil Day items so look out for us please! My husband is so funny. I grew up in a household where the huge American fridge and freezer were always full and I think my mother made sure that we had plenty to eat. My husband on the other hand, grew up in the UK where the fridges are not that much bigger than some U.S. college dorm fridges and when he moved out and lived on his own, he kept the bare necessities in his fridge and shopped when he started running out of fresh food. When we got married, our extremely opposite views on food shopping and fridge stocking had to come to a compromise. I tend to buy foods that I feel the mood to eat when I see it and may not necessarily feel like eating it a few days later. My husband on the other hand, has a bit more a routine and eats familiar things and also eats whatever is in the house to reduce waste. He gets annoyed with me when I let things rot because I forgot I bought something and/or because my eyes were bigger than my stomach. Anyway, after living in a better, less-wasteful way, I went home recently and found it uncomfortable to see so much fridge clutter back home and so much going bad and money being dumped in the bin. We were lucky to come upon an extra free older (piece of s**t) fridge to use to cool the excess that will not fit into our new, pitifully small (UK-style) fridge in our big Australian home. (Personally I don’t understand why the standard fridges in this huge country with big houses are not similar in size to the U.S. fridges…) This fridge is mostly used for our water, drinks and extra food that I’ve preserved or have frozen. On the outside of that fridge, he has started to use a dry erase marker to write a list of what is in there at all times so that I remember them (trust me, I’d really forget). Anyway, to make me remember to eat things or to communicate anything to do with food, my husband either lines up fruit that seems to be getting too ripe, or leaves me messages on the food in the morning before he leaves to work (I wake up a bit later) and then I walk downstairs to see the messages he has left for me. Here are just a couple of pictures of things he’s left me. I will add to this as I get more photos of my husband’s food communications. This picture of the milk carton is my husband copying a Sharpie™ commercial on TV. In the commercial, a young guy opens the fridge and sniffs and tastes a carton of milk. 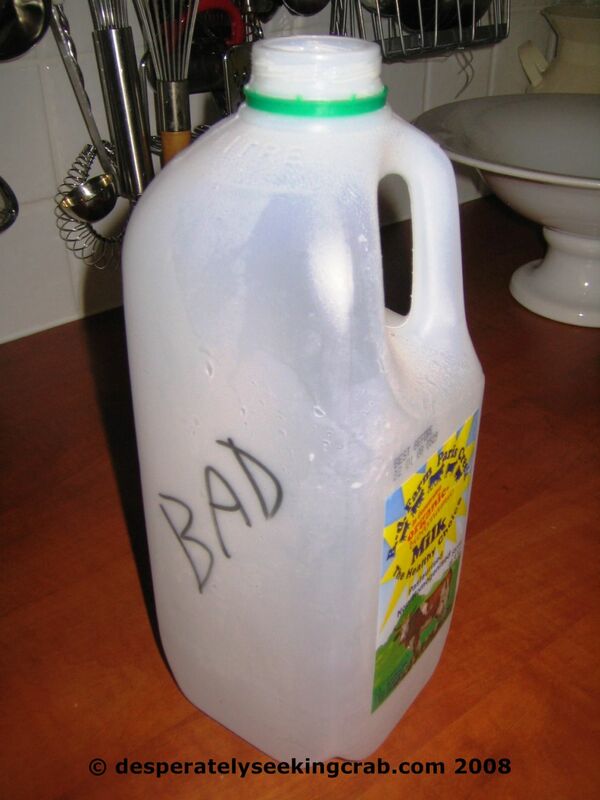 He then writes “BAD” on the spoiled milk and places it back into the fridge for his flat mates to discover it instead of dumping it in the sink and throwing it away! So my husband cracked me up one morning by doing the same but trouble was, I DIDN’T SEE IT only noticed the writing when I sniffed it! Good thing I wasn’t going to use more than a tablespoon of it that morning (for my tea). This was a really fragrant green fleshed honeydew melon but because some melons give me an itchy throat, I was waiting for the right mood to eat it. Why do I buy foods that cause me to suffer? Because, I do. 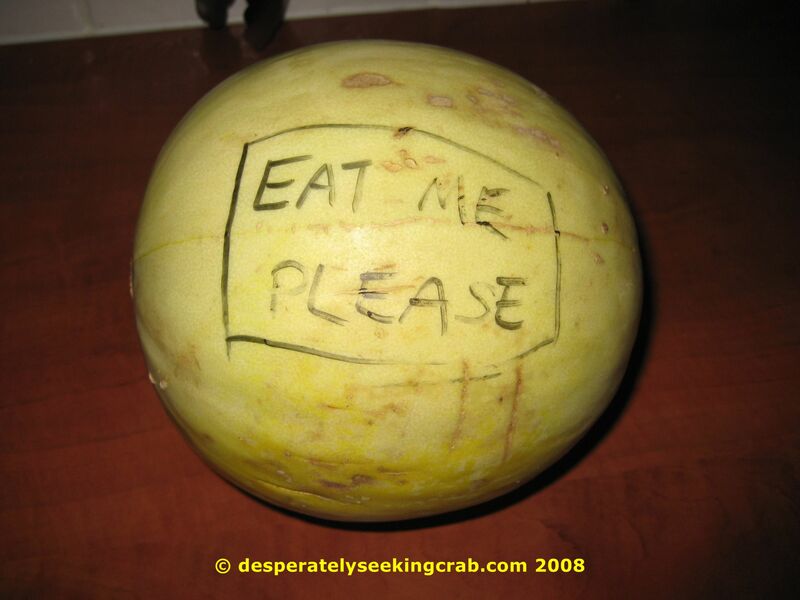 My husband doesn’t really care for melons but was tired of seeing it on the counter for a week so he wrote me a funny message…again, with a Sharpie™.